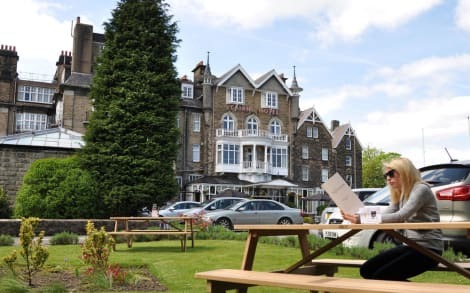 You'll be centrally located in Harrogate with a stay at Hollins House, minutes from Harrogate International Centre and Turkish Baths and Health Spa. This guesthouse is within close proximity of Royal Hall and Mercer Art Gallery.Rooms Stay in one of 6 guestrooms featuring flat-screen televisions. Complimentary wireless Internet access keeps you connected, and digital programming is available for your entertainment. Conveniences include coffee/tea makers, and both irons/ironing boards and cribs/infant beds (surcharge) are available on request. Take in the views from a garden and make use of amenities such as complimentary wireless Internet access and tour/ticket assistance.Dining A complimentary full breakfast is served daily. Enjoy recreation amenities such as a fitness center or take in the view from a garden. This hotel also features complimentary wireless Internet access, gift shops/newsstands, and wedding services. Stay in one of 136 guestrooms featuring flat-screen televisions. Complimentary wireless Internet access keeps you connected, and cable programming is available for your entertainment. Private bathrooms with shower/tub combinations feature complimentary toiletries and hair dryers. Conveniences include desks and coffee/tea makers, and housekeeping is provided daily. 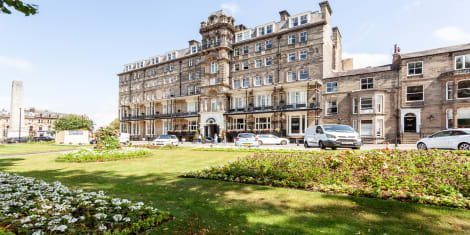 With a stay at Crown Hotel Harrogate in Harrogate (Harrogate City Centre), you'll be within a 10-minute walk of Harrogate Convention Centre and Royal Pump Room Museum. This hotel is 8.8 mi (14.1 km) from Harewood House and 10 mi (16.1 km) from Fountains Abbey. 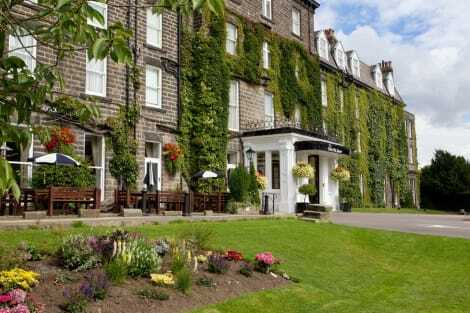 With an elegant Victorian exterior, the Yorkshire Hotel overlooks The Stray and offers a range of rooms just minutes from Bettys Tea Rooms & Harrogate Convention Centre. It has a Bar, Brasserie & WiFi. Many rooms feature a town-view and all benefit from complimentary toiletries by H2K of Harrogate, a flat-screen TV and room service. The majority of attractions in town are less than 5 minutes' away, Harrogate Bus & Rail Stations are closeby and Leeds Bradford Airport is just a 25 minute drive.